A showcase of the funniest people the UK has to offer as they perform their trade live from the London Comedy Store stage. 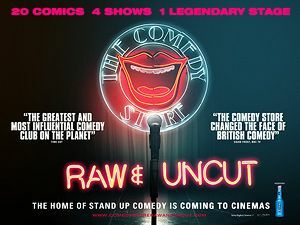 The Comedy Store: Raw and Uncut gives audiences the first-time opportunity to enjoy the very best in comedy from London’s legendary home of stand-up in the comfort of their local cinema. It’s fresh, new and hilarious and will showcase 20 of the funniest names on the thriving British comedy circuit. On the bill is New Zealand comedian and Chortle Comedy Award winner Jarred Christmas, the comedian The Evening Standard described as 'absolutely boxfresh' Tom Stade, Comedy Store favourite Ian Stone, rapper turned comedian Doc Brown – who supported Ricky Gervais on his 2012 European tour – and Foster’s Edinburgh comedy awards Best Newcomer nominee Imran Yusuf.